“Present you problem… code your workflow”! The official course textbook is “Bioimage Data Analysis”, a freely downloadable textbook where more details about most of these topics can be found. Trainees are encouraged to bring it either printed or accessible in a tablet/e-book reader. Coffee breaks are served daily ~11:00 and 16:00, lunches at 13:00 [1.5h] and dinners at 21:30! The first NeuBIAS Workshop will take place at the Poblenou Campus of Universitat Pompeu Fabra in Barcelona, where the Department of Information and Communication Technologies (DTIC) is located. Poblenou Campus is easily accessible both by public transport: Metro (L1 Glòries, L4 Llacuna), Tram (T4 Ca l’Aranyó, T5 i T6 La Farinera), Train (Clot-Aragó), and Bus (H14, B25, B20, 192, 92, 42, 40, 7, 6). It is also easily accessible by private transport but parking slots are really reduced. Please arrange your travel by yourself! If you have problems with booking (before 28th July) of any of these hotels listed above, please contact Joana (joana.clotet(at)upf(dot)edu). Applications were closed on July 15th 2016! Staff scientists, graduate students, post-docs and faculty, who work in the context of Bioimaging facilities and provide assistance to users in need of Bioimage Data Analysis. We expect some experience in handling image data, and a good level of familiarity with imageJ/FIJI; this course is not appropriate for complete beginners! (in 2017 NEUBIAS will offer more NEUBIAS Training Schools including one for “Early Career Investigators”) Very basic programming knowledge is a plus, but not a requirement. Interested applicants should prepare a letter of motivation (max 2000 char.! ), provide contact information and fill a form to assess their level of proficiency and interests; applicants are also encouraged to provide details about a mini-project that they wish to bring to the course (e.g. a specific image analysis tool or workflow that they are interested in getting help with, from our expert trainers). If you are an early career investigator and have no experience with image processing or analysis, NEUBIAS will organize the first training school for Early Career Investigators (at the Gulbenkian Institute, Portugal, 12-15 Feb 2017) dedicated to Life Scientists that aim at diving into BioImage Analysis. 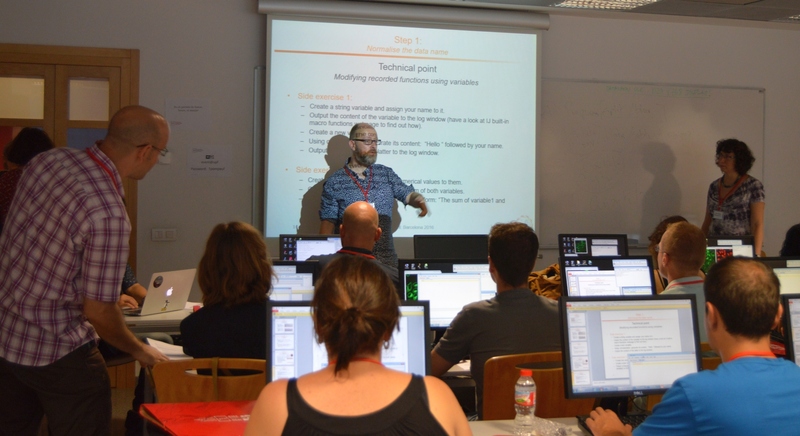 If you already master BioImage Analysis tools and feel you have a solid understanding of workflows and programming, NEUBIAS will also organize an advanced course for Analysts, focused on developing advanced workflows and applications, and delivered by developers and confirmed analysts (at Gulbenkian Institute, Oeiras – Portugal, 12-15 February 2017). Must fill valid application form by July 15th (2016). NEUBIAS will offer competitive Travel Grants to a number of the Trainees applicants, affiliated to institutions in COST member countries, Near-Neighbour Countries or approved European RTD Organisations (check definitions in Vademecum here). Please check in the application form how to apply for those grants by filling the additional fields enabling to submit a justification. The grants are supported by COST (funding body of the NEUBIAS Action). Eligibility and reimbursement modalities will follow the criteria/general COST policies (check the Vademecum here). Granted trainees will be notified by July 18th, 2016, and grants will be executed after the Training School (daily signature on attendance sheets compulsory for grant winners). The grant amounts to about 920 euros in concept of travel and accommodation for this 4-days (i.e. 5 nights) Training School, to be reimbursed upon acceptance and after participation, according to COST rules (check the Vademecum here). COST supports Local organizers with a financial contribution and supports Trainers. Lunch and coffee breaks will be included for all participants. The course material will be delivered electronically and on pen-drives.